We hope you will join us for an evening of comedy, cake and coffee! Come and laugh with other women, and connect to new friends with similar interests. 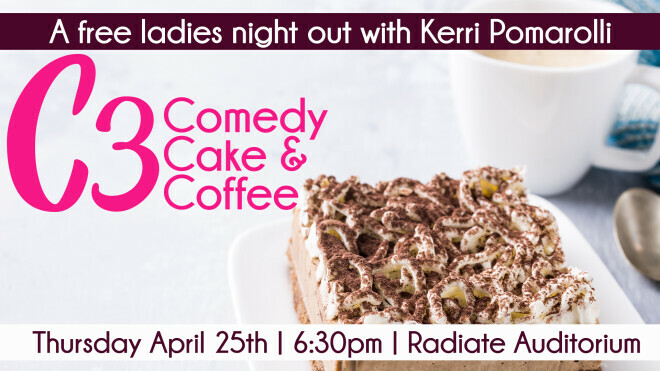 This free ladies' night out with Kerri Pomarolli is the perfect blend of comedy, inspiration, and message! If you are willing to bring a cake to share, please check out this link for more information and to sign up. Spread the word to your friends and join us for C3: Comedy, Cake and Coffee! Kerri Pomarolli is a stand-up comedian, actress and author based in Los Angeles. She has appeared in over 75 stage productions, has had recurring roles on several soap operas, and has been in movies like "DeadLock" and Netflix's "The Brennan Manning Story." She also authored the popular devotional "Moms' Night Out and Other Things I Miss," inspired by the movie of the same name. Learn more about her at her website.